For three months now there have been stunning reports of the difficult, challenging, and horrible olive harvest in Italy. Decades have passed since such a crisis last occurred, and that, the Tuscan freeze of 1985, did not reach the broad geographical proportions of this one. During the month of October, we learned of the losses on a daily basis. Each phone call and email told a tale of crop failures and weather issues. Few areas were immune. In general, windstorms, rain, a cool summer, and a hailstorm were the weather issues. A bug and a fungus took hold as well. 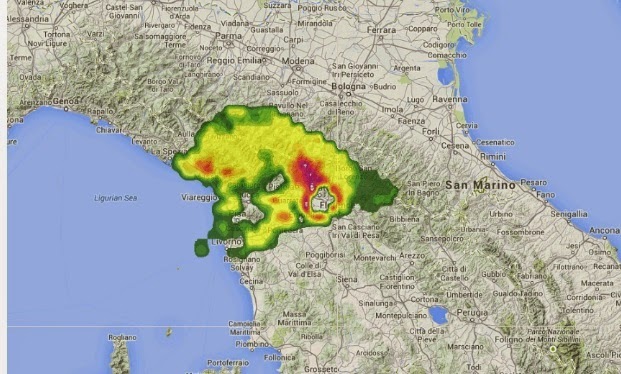 Videos of the 18 September 2014 hailstorm in Tuscany can be seen here and here. As reported to us, the harvests in Sicily were early and small. Problems were noted from The Veneto to Puglia. Producers in Tuscany, Umbria, Marche, and Abruzzo piled on tales of woe. Outstanding producers chose to bottle no oil in the fall of 2014: Tenuta di Capezzana, Poggio Etrusco, Avignonesi, Fattoria di Monti, Decimi, and others. We were informed of difficulties among many others who have valiantly produced much smaller quantities than normal. And, need we mention price increases? There is a human toll that goes far beyond the kitchen table. Families, including farm workers, and bottlers, have experienced reduced wages from the poor harvest. Quality olive oil will likely cost more than ever. Remembering that there are always variations in characteristics for year to year, the 2014s we have tasted provide a remarkable testament to the skills of the producers. Aromatic, fresh, grassy, bitter, and spicy can all be found in our lucky bottles. We continue to remain optimistic as we have carefully sourced 30 selections so far this season. 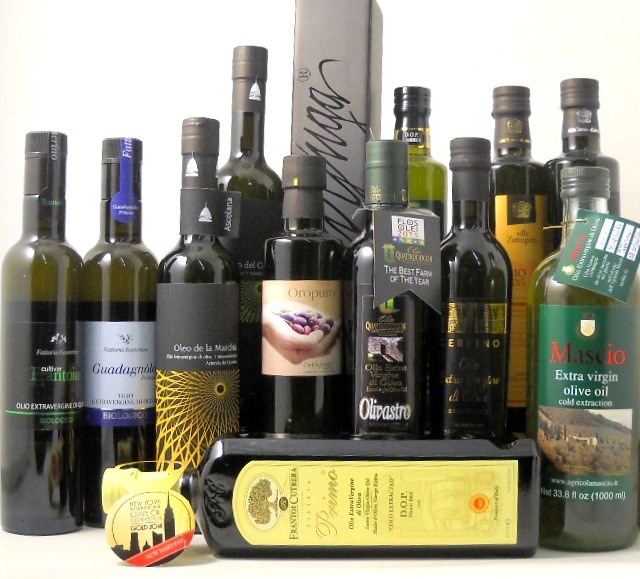 Our full line of new olive oils (many shown in photo) can be purchased here. Our challenge is to continue to bring in the best Italian extra virgin olive oil in quantities to carry us through to the 2015 harvest. For years, the most reputable producers have followed the tradition of the dating olive oil by harvest year, noted as the year in which the harvest began. In the Northern Hemisphere, whether Italy, Spain or California, the olive harvest takes place October to January. This is October and the current harvest is known as the 2014 harvest. When the olive trees are still being picked in January, this will continue to be labeled as the 2014 harvest. But in an effort to prove faux freshness, and one-ups-man-ship, California producers have decided that we are already in the midst of the 2015 harvest. That nomenclature may work for automobiles, but we think it is a bit rotten for olive oil. Don’t be deceived by this new dating schema developed by Californians. Think before you buy. 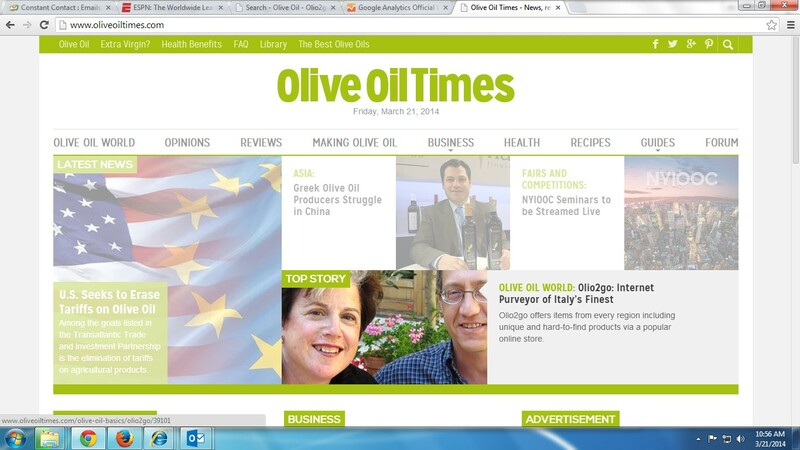 For more information, see this article in the Olive Oil Times. There’s something fun about Planeta. 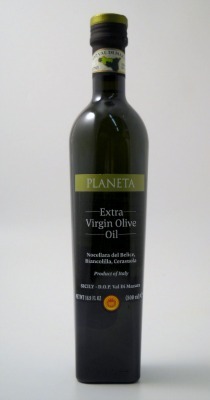 It may be that customers recognize the olive oil logo, and immediately smile at the good memories associated with Planeta’s top quality wines from their estate in Sicily. Olio2go has visited Planeta at their marvelous estate and we’ve also had the good fortune to meet with Penny in the States. We think the world of their top production of extra virgin olive oil (and wine too, but we don’t sell that!). The availability of summer produce has driven the selection of Planeta DOP Val di Mazara as our choice for June for Olio2go’s Olive Oil of the Month Club. Salads of greens with leafy herbs, your favorite bruschetta, a platter of roasted vegetables… (we could go on for a bit here)….they are all richly enhanced by a healthy drizzle of Planeta. Send an email to us for more information on Olio2go’s Olive Oil of the Month Club. It’s time to celebrate our latest Olive Oil of the Month: Radici of Molise. Radici Italiane means Italian roots and we have found Radici of Molise to be the perfect selection for those seeking their Italian heritage. More Americans emigrated from southern Italy including Abruzzo e Molise (one region until 1963) than any other region. The city of Campobasso is the largest in Molise. Perhaps Campobasso has been mentioned at your grandmother’s table? Radici is smooth, yet robust, and it is produced in the small town of Larino, from the famous Gentile di Larino olive cultivar. It is wonderfully well balanced among the fruity, bitter, and peppery notes. Very low acidity, 0.19%. It is recommended for salads, fresh and grilled vegetables, and for bruschetta. To join our Olive Oil of the Month Club, just click here to send us an email. 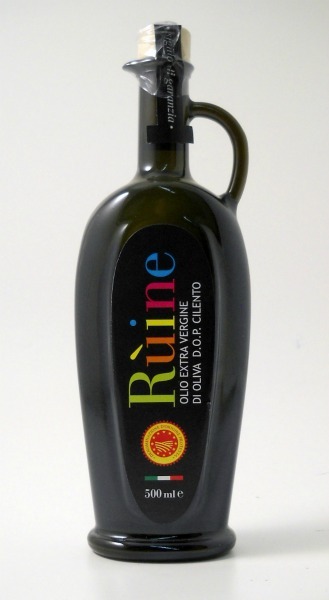 Ruine 2013 Extra Virgin Olive Oil comes to us with the most colorful label we have seen. It is the first, striking, indication of the lively, fresh oil in the amphora bottle. Produced in Cilento, in Campania, two hours south of the beautiful Amalfi coast. The olive trees have been growing on these hills since ancient Napoli (oldest city in Italy) near and around the town of Pisciotta. The local olive, “Pisciottana” is the primary olive of the blend, grown in the special “Ruine” soil. 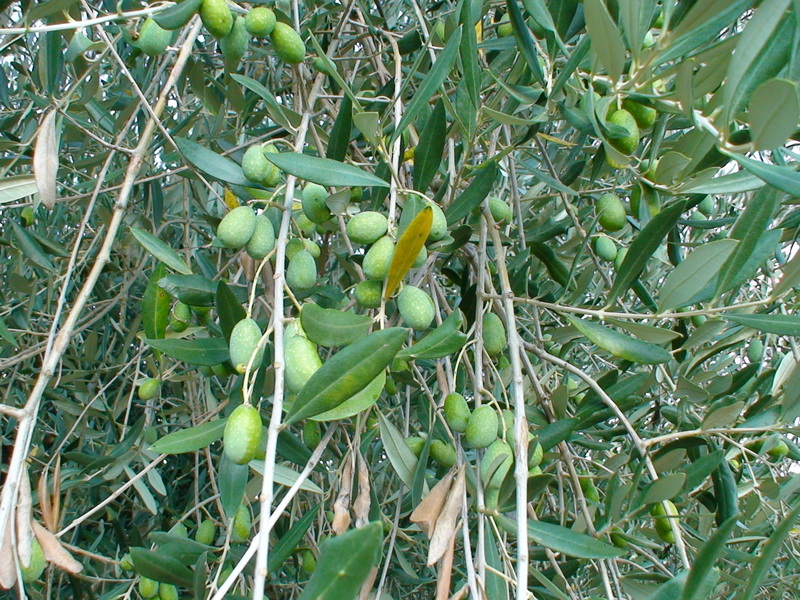 The olive and the land are indigenous to Parco Nationale del Cilento. Pisciotta is surrounded by 60 other typical little towns and villages (Paesi) each with their unique traditions and specialty food(s). Ruine olive oil has received the D.O.P. Cilento mark and it is recognized by the European community. This superior oil is emerald and brilliant coppery with aromatic notes of a fruity, medium intensity with fresh herbal notes that blend well with a deep but very elegant feeling on the palate, along with the spiciness and peppery notes typical of the Italian land and of these Mediterranean latitudes. Local cuisine includes foods that are just perfect with the local oil, as you would expect. Local vegetables, meats, cheeses, and wine fill the tables, along with, figs, and prickly pears, which all add to fabulous and delicious treats. Varieties: Pisciottana (primary 75%), Ogliarola, Frantoiana & Rotondella. We’ve just discovered the Heritage Radio Network and enjoyed listening to this superb interview with Nancy Harmon Jenkins. The interview covers many important topics — Olive Oil is covered in the first 11 minutes — including our central focus on Italian Olive Oil. The Mediterranean Diet, lifestyle, cooking with olive oil, Slow Food, and ancient grains (like farro) are included. Listen to Nancy and then visit Olio2go for Italy’s Finest Olive Oil. Celebrating our 15th year of selling Italy’s authentic olive oils to discerning consumers! We’re thrilled to have been interviewed by the Olive Oil Times for our role in bringing authentic Italian extra virgin olive oil to the U.S.
Olive Oil: The juice pressed from fresh olives. The quality is depends on the ripeness and condition of the olives at the time of pressing. Olives that are just ripening and have no bad fruit, when crushed promptly, produce the highest quality olive oil, extra virgin. Extra Virgin Olive Oil: Acidity level below 0.80% and a professional organoleptic taste test indicating no faults. This is the best quality of olive oil, and those with the lowest acidity levels are considered Super Premium. Olive Oil Benefits: Many of the known and researched benefits of olive oil are tied to the Mediterranean Diet and issues related to Inflammation (The Zone Diet). The FDA allows a health claim to be included on the labels of olive oils. Italian Olive Oil: We’re passionate about Italian olive oils because of the craftsmanship and care – and centuries of traditions. To us, others are fine, but Italian olive oils are the best. While any olive oil bottled in Italy can carry the Product of Italy label, we work with carefully selected producers to ensure authentic production and quality. Crush Dates and Labels: It is important to read an olive oil label, but we recommend that you read it carefully and with thought. A Tuscan olive oil will simply be labeled as Raccolto 2013, because Tuscan olives are only harvested between late October and early December each year (with slight variations for weather conditions). You may also be interested to learn more about organic certification and labeling for olive oil. How do Italian Extra Virgin Olive Oils Differ? Northern olive oils tend to be exquisite and less intense than those from other regions. Tuscan selections tend to be intense and flavorful and peppery; those from Umbria are slightly rounder than the Tuscans in flavor. Those from Lazio (the region of Rome) bring forth essences of green, while those from Puglia (the heel of the boot) finish with a strong pepper kick. The extra virgin olive oil selections from Sicily are grassy and some offer elements of tomato. There are many differences, but that’s the quick list of characteristics. Cooking with olive oil: This is a favorite topic and we look at it simply. The producers do not buy olive oil to cook with. They use what they have carefully nurtured and crafted. A home, we keep 2-3 bottles in the cool, dark cupboard and choose the bottle with the least if we need a couple of tablespoons to roast vegetables or sauté chicken cutlets. How to Store Olive Oil: In a cool, dark place. We do not recommend a refrigerator as some may get too cold. (And the refrigerator test is not valid). For more information on quality extra virgin olive oil, we recommend the Olio2go Olive Oil FAQ and this piece on the Anatomy of a Great (Olive Oil) Label. Sign up for our email list to stay up to date on new olive oil arrivals and the latest in olive oil news.